If there is one thing that trail camera users struggle with, it is battery life. There is nothing quite like trekking out to a hunting lease only to find a game camera with dead batteries. You have no way of knowing if you missed any camera triggers and no way to know where to set up your hunting blind. But there is a foolproof way to make sure you never have another missed detection: a solar trail camera. Solar power ensures that your trail camera always has the power it needs. The 46 infrared LEDs have impressive range, but there is a slight red glow. Users can view photos on the onboard 2.4-inch color display. The 42 low-glow LEDs provide impressive depth on night photos, with flash range approaching 90 feet. Time lapse is one of the few added features. Photo quality is advertised as 12MP and video at 1080p, but the actual results are less spectacular than those numbers suggest. Daylight photography is impressive, with deep color hues and sharp contrast. Picture quality is also not as dependent on lighting as it is for some other trail cameras. Shooting 4, 8 or 12MP photos and true 1080p video, it can compete with any manufacturer. But it also offers the option of getting your images sent directly to your cell phone. The ECO brand represents a relatively small market share in the trail camera industry, but its offerings are high in quality and packed with functions. ECO’s solar panel puts out 1500 milliamps for 1.5 watts of power. It also requires a minimum of four AA batteries, which serve as backup in case there isn’t enough sun to power the camera. The unit can accommodate up to eight batteries and can run on battery power alone. It also has a 5-volt port for external charging and a 6-volt external output jack. Trigger times of .2 to .6 seconds are quite fast for its segment of the market. Its 120-degree PIR sensor matches up well with its 120-degree field of view, keeping empty daytime shots to a minimum. However, with an 80-foot detection range and a 65-foot flash range, the subjects in night photos can be mysterious. The 46 infrared LEDs have impressive range, but there is a slight red glow. Users can view photos on the onboard 2.4-inch color display. This trail camera can also shoot three-photo bursts per triggering. Photo quality is configurable from a high of 16 megapixels down to 3MP. Using the lower-quality settings will save space on the micro SD card, which has a maximum of 32 gigabytes. The ECO can shoot video in 1080p, selectable from 3 seconds to 10 minutes in length. The HD video is limited to 25 frames per second, though. At the 30-fps rate, the ECO unit can shoot in 720p, 480p and 240p, though the resulting videos will stutter. This ECO trail camera is not without its faults. It does not offer the various photo and video modes of some competitors, and its solar panel is separate component. But simplicity also means ease of operation. The menu is basic and intuitive, and not every camera in this segment has a full-color display screen with the ability to view photos and videos. captures color images by day/IR by night. Built-in solar panel & rechargeable battery. The folks at Spypoint like to keep it simple, but that doesn’t mean they aren’t innovative. The Solar-W camera is nearly identical to Spypoint’s Force-10 camera, except that it has a nifty, integrated solar panel that gives it seemingly infinite life. It also boasts a .3-second trigger speed on photos and an adjustable detection range. The Solar-W requires six AA batteries, but it won’t use them until its internal rechargeable battery is three-quarters depleted. There is also a 12V external power jack, with strap loops and threaded insert for mounting. Photo quality from the 10MP camera is sharp in daylight hours, with excellent color and contrast. The programmable photo stamps include moon phase, temperature, date and time. Detection distance ranges from 5 to 80 feet, and burst mode enables up to six shots per detection. The 42 low-glow LEDs provide impressive depth on night photos, with flash range approaching 90 feet. It may take some fiddling to match the detection and flash ranges to the needs of any particular location, though. Video shows the graininess one would associate with 720p, and they aren’t as bright as some competitors. There also isn’t a microphone, so videos are silent. That said, the Solar-W shoots decent footage in good lighting and useable video at night. The 2-inch display screen enables full-color review of the images stored on a 32GB SD card (not included), and the simple controls are intuitive. Its detection circuitry is as good as any, with impressive .6-second recovery on photos. You can find more models of Spypoint here. MyCommand Solar Trail Camera 12MP Animal Game Time Lapse Cam with Night Vision Motion Activated , IP66 Waterproof 1080p Spy Outdoor Deer & Wildlife Hunting. 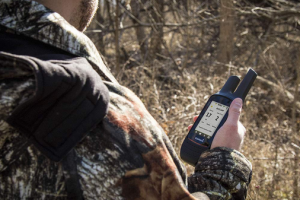 For the hunter or homeowner looking for as little fuss and complexity as possible, the My Animal Command trail camera is here to help. The 2500 mAh solar panel doubles as a rechargeable battery, which has a multi-position metal base. The trail camera body also holds eight AA batteries for constant, uninterrupted use. It stores video and JPEGs on a removable SD card (up to 32GB). Time lapse is one of the few added features. Photo quality is advertised as 12MP and video at 1080p, but the actual results are less spectacular than those numbers suggest. Picture quality is still quite good, with its only real problem being a bit of overall darkness. Night photos exhibit that darkness as well, though a 65-foot IR flash distance keeps pictures from being empty. Trigger times are around the half-second mark – fast enough to be competitive. But the real draw is the months on end of battery life. A full-color LCD display enables photo and video review, as well as navigation of the simple, intuitive menu. Mounting options do not include a Python lock, though, so be prepared to camouflage your trail camera. Other than that, it’s hard not to like the My Animal Command solar trail cam. Its overall ease of use is extraordinary. Just unbox it and install it – that simple. The Spypoint Solar has the potential to rewrite the rules of the trail camera industry. Its 12MP picture quality and 42 low-glow LEDs are good without being earth shattering, but the speed at which the Solar does its business is game-changing. At .07 seconds, trigger speeds here are unlike anything else. And yes, that is seven hundredths of a second. Couple that hair trigger with .7-second recovery times, and you have the fastest detection circuit on the market at the time of this writing. Other manufacturers are surely taking notes. Daylight photography is impressive, with deep color hues and sharp contrast. Picture quality is also not as dependent on lighting as it is for some other trail cameras. Night photos can vary in quality depending on flash setting. Infrared-Boost mode allows full use of the 100-foot flash range, but moving targets may blur. In Blur Reduction mode, nearby targets will be more clear, but deeper targets may not be exposed thanks to the limited flash range. The detection range is about 120 feet, though, so users must weigh having blurry versus dark night pics. Even in video mode, the Solar is blazingly fast. Its .5-second video trigger speed would be top of the line as a photo trigger speed. And because the recovery time remains .7 seconds, videos can be shot in quicker succession than almost anyone else can do it. Sure, those videos are only in 720p and lack depth at night. But daylight video is clear and smooth, with only a hint of blurring on moving targets. Spypoint kept picture and video modes minimal on the Solar. Customizable detection zones (5 to 80-plus feet) and IR flash distance are easy to navigate, but there are not many other features besides burst mode. But the solar panel charges on minimal light, and the 2-inch color display shows a charging percentage as you position the trail camera. Mounting options are limited to a strap or a threaded receiver, but concealment of the small, tough case is simple enough. Rather than produce a standalone, integrated solar trail camera, Stealth Cam simply offers its GX-W Wireless game camera in combination with its 12-volt battery and solar panel charger kit. It’s hard to fault the choice in cameras or manufacturers. Stealth Cam has been in the business since the days of 35mm film, and its G45NGX is a feature-laden trail camera. Shooting 4, 8 or 12MP photos and true 1080p video, it can compete with any manufacturer. But it also offers the option of getting your images sent directly to your cell phone. This trail camera utilizes 45 black IR LEDs, but it still produces a slight red glow. Night photos are clear and crisp as you would expect from a low-glow camera, and daytime pictures have rich color and sharp contrast. Video length is variable from 5 to 180 seconds, but the unit only sends short compressed files. Everything is stored onboard using a 32GB SD card. Being wireless has benefits as well as detractions. Adding functions tends to complicate usage, and the GXW is no exception. Upon first startup the user must check the installed firmware versus available downloads on Stealth Cam’s website and update if necessary. Failure to do so can cause glitches in the user’s experience with the cell phone app, which is necessary to view the pictures the camera sends. After that things get easier though. Users can set the camera for bursts, time lapse, photo or video modes with phone or onboard menu. This wireless solar trail camera is compatible with iOS and Android phones (here are some battery based wireless trail cameras). A cellular subscription may be necessary, though rumors of workarounds on the internet are interesting. Unlike other options, the solar panel and battery pack are usable on many other trail cameras. The camera also operates on 12 AA batteries in the event that the solar panel cannot charge, though these panels charge in almost any light – even artificial. Here you can see some popular Stealth models. While it is possible to attach a solar panel to many battery-powered trail cameras, it is not the easiest way to go about things. Acquiring and connecting a solar panel requires matching up the connection and voltage on the camera and the panel. It also may entail purchasing any number of electrical connectors, reducers, etc. Many aftermarket solar panels, though effective, are bulky and conspicuous. They may also have reflective surfaces. Going solar from the start means you can be certain everything will work together. The solar panel on a solar game camera doesn’t run the electronics directly. Rather, it charges a battery that powers the camera. Often a Lithium-ion type, the rechargeable battery may be external or it may be onboard. Either way, manufacturers typically offer the option of using disposable batteries – like AAs – instead of or in addition to the solar panel. The disposable batteries are not there to replace the solar panel; they are there to supplement it. 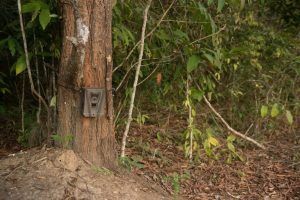 They supply power that the trail camera can use when the rechargeable battery is depleted, either from overuse or because of overcast conditions. Once the solar panel produces enough electricity to recharge the battery, the secondary batteries are no longer in use. Of course, alkaline batteries are not without issues of their own. Besides their expense and their limited lifespans, AA batteries have a tendency to leak or corrode when exposed to heat. While not an issue in every part of the country, folks in hotter areas will know the frustration and damage exploded AAs can cause. Solar power tends to work well in areas where temperatures can be problematic for alkaline batteries. Not many solar panels need direct sunlight to properly do their job. Most will work in a shaded area, but a solar panel will always work best when it gets direct sunlight. When selecting a location for a solar trail camera, think about the amount of shade that the area gets. Because of the way they are wired, a single shaded solar element can sometimes stop a whole row of cells from producing electricity. Also consider the time of year and the position of the sun in the sky. In summertime with the sun directly overhead, try to place your trail camera where it will get at least a half day of full sun. Point it either eastward or westward, whichever direction is less shaded in your chosen location. As winter comes around and the sun begins to sink in the sky, it’s better to have the camera in a south-facing location (in the northern hemisphere). Some modern solar panels can charge their batteries with very little light, so get to know your equipment’s specific requirements. Unfortunately, you cannot just set your solar trail camera out in the wild or attach it to a building on your property and forget about it. Depending on the area, it may not take very long for the camera to develop a layer of dust. When covered by dust (or snow or leaves), solar panels do not operate at peak levels. Soon the battery will be drained and the trail camera will be operating on its disposable-battery reserves. Be sure to clean the solar panel every time you visit the camera’s location. Other than the way it gets its power, a solar trail camera is no different from any other trail camera. They all utilize roughly the same passive infrared detection circuitry and are bound by the same near-infrared emitter issues. Darker LED emitters tend to have shallower fields of view at night, while brighter lights are visible to both game and humans. Changing batteries in a trail camera may be a simple and inexpensive task in isolation, but it can soon become an expensive pain in the neck. Whether you’ve installed your camera in an inaccessible location on your home property or you placed out in the wilderness, the time it takes to complete this exercise are not coming back. Added to the cost of disposable batteries, the frustration is enough to push many trail camera owners to review their options. Solar trail cameras should be at the top of anyone’s list of alternatives to the standard options. Many of them can operate unattended for years on end, depending on their power draw and the efficiency of their solar panels. The only reason to visit one is to review the photos it has captured. Other than their carefree use, solar trail cameras are no different from their battery-eating kin. It is easy to see the future of the market.